Dont even realised when it started, but my family have been traveling together at least once a year. It becomes something like a tradition. So this year we decided to go to Vietnam. Alhamdulillah all 14 of us manage to go without any difficulties. 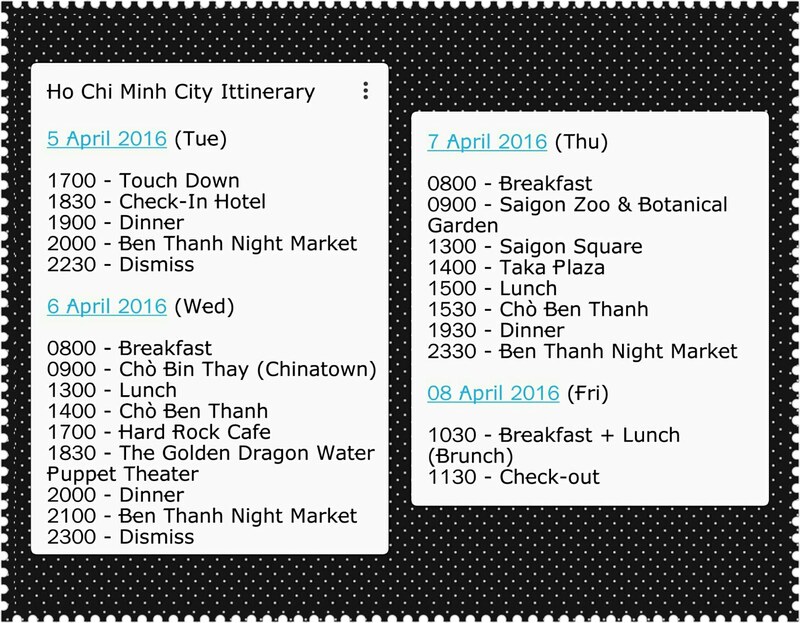 Our 4D3N (5th-8th Apr 16) journey took place in Ho Chi Minh City (HCMC) or used to be called by the name of Saigon. Since this is my third time going there, i was asked to arranged & planned everything. *sighs.. I just need to asked them for the money i needed. Be their travel guide it is. Nasib family sendiri, kalo tidak tak kuasa la juge. Jadi, dengan mengambil kira kanak-kanak dan ibu mengandung yang akan turut serta, i planned for a very light and easy shopping trip. We depart from KLIA2 on 5th April-Tuesday around 1455 hrs (Malaysia Time) and arrived at Tan Son Nhat International Airport, approximately 2 hrs later. HCMC adalah bandar yang sangat sibuk yea. No further arguments. Hiks! Dengan motosikalnya, keretanya, basnya.. fuhh..semua nak jalan sekali. Since their vehicle operates in left-hand drive, it is quite terrifying to seat front, on the right next to the taxi driver. huuuu ngeri.. Sudah laa teksi tu memang pengangkutan utama kami di sana. Heee even if the destination was in walking distances, bare in mind we were traveling with toddlers, so anything more than 10 minutes walking wasn't really a good choice with such crazee traffic and cab fare wasn't so pricey. Affordable. Selesai semua urusan selepas touch-down, kami terus keluar dari airport cari teksi untuk ke hotel. Seperti mana yang telah dinasihatkan oleh blogger dan traveler2 lain, sila ambil teksi "Vinasun" ye, warna temanya hijau putih. InsyaAllah boleh dipercayai. Tambang dari airport ke hotel lebih kurang VND160,000.00 . Kami 1 famili je memerlukan 3 buah kereta (Jenis Innova). 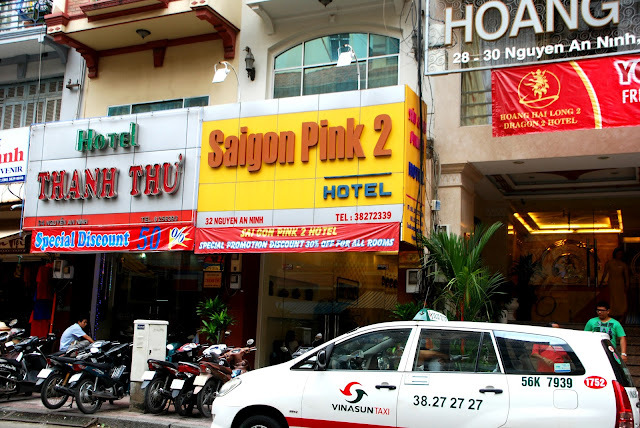 We stayed at Than Thu Hotel in Nguyen An Ninh, District 1 nearby the Ben Thanh Market (5 minutes walking distance). This area was also known as Malaysia Street since you can easily met other Malaysians here. Bersepahh orang kita baq hang. (>_<) Hotel ni sy booked thru Agoda saje. Priced at RM95/night (Standard Room) & RM170/night (Triple Room). 3 Standard rooms & 1 Triple Room for us - a total of 10 Adults & 4 Kids. Rooms were nice and good enough for us. Staffs was friendly and helpful too. Sampai hotel lebih kurang 6 petang. Waktu di Vietnam adalah 1 jam lewat berbanding Malaysia. Jadi, walaupun baru pukul 6, keadaan sekeliling dah gelap. Depan hotel, peniaga-peniaga dah ready nak bukak kedai. Fyi, there would be a night market everyday in this area. Murah dan meriah. Gittew. Hohoho.. Check-in & letak beg, terus turun balik cari makan malam. Habis makan, jalan-jalan kat pasar malam. Cuci mata dulu. Sabaq, sbb night market tiap-tiap malam ado. End of day 1.